I've just been wading through a report by the New Zealand Fire Service and it doesn't make for good reading. Especially as far as the Common 3 or 4 way multi-box is concerned. Figures collated from Incident Fire Reports, show that multi-boxes had a dis-proportionately large showing in the causes of House Fires. What tends to worry me, is I've seen these things at fires and although they do have an in-built Overload device, I've still yet to find a fire damaged one that the Overload has actually operated on, none of them have actually tripped to prevent the box from overheating, melting and consequentially starting a fire. What scares me even more, is the fact that I've seen in DIY store leaflets here, versions of this sort of thing, with 4,6,8,10 and 12 sockets on them, all fed from a 10A Socket-outlet. Sure, I realise that a fair bit of common-sense is required on the part of the user, but having said that, how many Home-owners do you think, would be bothered to even check what sort of wattage they are putting through one of these devices?. However, in the majority of cases (here anyway), these devices are hidden behind wooden Entertainment Centres, under plastic TV sets and in some cases, under beds. I'd personally like to see the things banned, after all, they are really only a stop-gap measure where there aren't enough Sockets installed in a given room. What do you guys think about these devices and thier use?. I tend to agree Trumpy. Some of these things do seem to be inviting disaster. I would like to see more of them fitted with MCB protection, instead of fuses. The huge ones, used ostensibly for IT/entertainment equipment, are a disaster waiting to happen as they become more and more available in the shops. Banning them? This would be ideal - but I don't know how easily one could justify it... I have a six-way under my PC, and each way is in use. It is plugged into a twin 13A socket - the desk-lamp is in the other half. To fit seven sockets ( or four doubles anyway ) would be a bit of an eyesore if I ever decided to move the PC station! There is not a lot you can do about these things. The multi-boxes here do have an MCB in them, but what thier Time/Current characteristic is like I'm not sure. The Red dot next to the cable entry is the Overload MCB. They should be reasonably OK if protected by a fuse / MCB. The ones that worry me in UK/Ireland are the unfused double-adaptors. It's quite easy to overload a 13A socket with one of these by simply plugging in 2 heavy appliences and I've seen them used in kitchens with kettles, toasters etc etc.. I'm not sure about banning them as an overall device. The fuse or C/B should provide adequate overload protection. If it doesn't, then shouldn't we be addressing the quality of the unit in question rather than the concept as a whole? The simple sollution would be to require that all multi-socket devices carry over current protection at a rating appropriate to the socket outlet it's going to be plugged into. 16A in CEE 7/7 countries. I have never seen a powerstrip cause a problem here. The only thing I've seen melt and catch fire is an extension reel which was fully loaded and not uncoiled. They should be designed to withstand a bit more heat or at the very least have a temprature trip out on the reel housing. Paul has a good point with respect to quality. It's not really an MCB in these things, only a simple thermal element. You guys are right though!. This kind of had me thinking about the sort of protection used in these devices. So off to work I trundled, with a multibox and hooked it up to one of our Variable Dummy Loads in the Transformer workshop. I hooked the unit up to a 32A MCB and repeated the test, I turned it off after 10 minutes, as the Multi-box was starting to smell funny, and when I picked it up, it was more than warm to the touch, but still the OC device never tripped. If it doesn't, then shouldn't we be addressing the quality of the unit in question rather than the concept as a whole? Yes, very true, after having done that to the box I thought I'd open it up and see what makes one of these things tick and inside there is a series of Phase, Neutral and Earth busbars inside for each socket, although I use the word busbar loosely as the bars were about three times the thickness of tin-foil and bent rather easily. I picked up the little over-load and dropped it again as it was really hot!. The build quality of these boxes we get here these days is rediculous, even the cords don't even look like they would handle a full 10A, if they had to. Another concern is though, the majority of the houses where these devices are used, don't have MCB protection, instead having the original Porcelain fusing. I suppose at the end of the day, it all comes down to who can make the product the cheapest, even if quality is lower than it should be. The quality of powerstrips is certainly very variable. 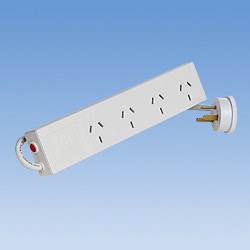 I've seen BS1363 types very similar to what Mike describes -- Thin "busbars" with the contacts for each outlet integral. Many of the older 1960s strips were far superior in construction, with a line of individual panel-mount BS1363 sockets fitted into a solid metal enclosure.